As with all Threads of Life events, volunteers are at the heart of each family forum weekend — often in quiet and steadfast support for the families attending. Here, on our blog, we often profile volunteers from our speakers bureau, volunteer family guides, peer support facilitators, and those bringing workplace health and safety to the forefront with Steps for Life. But providing families affected by a workplace tragedy with a safe space to land at each regional family forum is also a true labour of love for all who are involved. The mark of a well-organized event is that it seems to move along effortlessly. 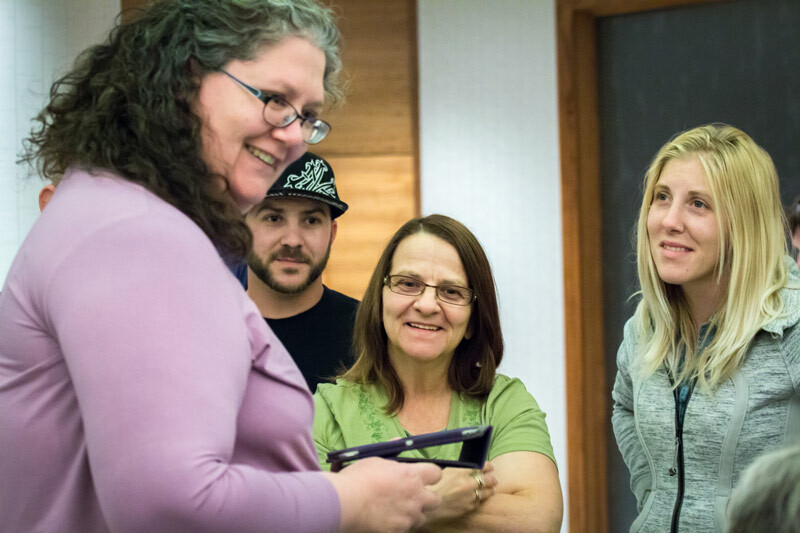 It’s possible for family forums to unfold as they do because there are many volunteers working diligently – in the forefront, and behind the scenes – to make the experience as meaningful and supportive as possible for the families attending. Joe and Judy Micieli have been attending the Central Family Forum since 2016. When their son Nick was killed by a distracted driver who rear-ended his work van, Joe and Judy had a hard time finding grief support that met their needs as a couple, and particularly for Joe as a dad. Judy shares, “Moms and dads share the same child, but their relationships with that child are unique. It’s very important for dads, like moms, to have a safe place to talk about that unique relationship with their child — in confidence and with other grieving parents.” Having worked as a volunteer in hospice for years, Judy had the resources and knowledge to start their own parents bereavement group, which is exactly what they did. At the Central Family Forum, they co-facilitate a session called “Walk with Me” for parents grieving the workplace death of a son or daughter. Julia, Joe and Judy are just three of the dozens of volunteers that make the family forums such a positive experience for the families who attend each year. I would encourage families attending a family forum — for the first or fifth time — to take the time to thank some of the volunteers for making the event meaningful and supportive for you. You’ll find them at the registration check in, in your sessions and at your dinner table. They aren’t there for the acknowledgement or accolades, but your thanks means the world to them. It’s a labour of love, and it’s so important that these volunteers know how deeply their heartfelt contributions are appreciated.